90 pounds of snap peas! The snap peas also went gang busters last week. I sent people out to pick and had no idea we would end up with 90 pounds of the little goodies! Next week's picking will be very slim, if at all. So enjoy them! I keep hearing stories of kids (or parents) taking the entire bag and sneaking off to eat them all for themselves. I think there are enough for everyone to share this week. Let's talk a bit about preserving methods for some of the items you are receiving so abundantly lately and in future weeks. Instead of feeling frustrated with getting some of the same items over and over again, I hope you will try some of these tried and true tricks that will keep you enjoying your farm share well into the winter months. Greens like kale, Swiss chard, and collards can be frozen for later use. If you are going to use them in smoothies sometime this winter, you can simply pack the greens into a freezer bag and that's it. No blanching or other preparation necessary. If you are going to use the greens in soups or other recipes, you may prefer to chop everything into the size as you intend it to be for later cooking. It will be much easier to cut when fresh than in it's later frozen or thawed state. Again, if you will use the greens soon (in the coming months) there is no reason to blanch. I have done this for several years and notice no difference at all in taste with freezing fresh vs. blanching. In fact, I prefer the fresh frozen. Our fresh herbs like cilantro and parsley are growing very well right now. Later we will have dill and basil. We will be giving big bunches each week that it's "perfect" to harvest, even knowing it may be too much for some people to use each week. We have no choice but to harvest for eating or loose these crops to bolting. Most herbs can be preserved with quick and easy methods. If you own a dehydrator, simply spread the herbs on the drying trays and dehydrate until dry. I prefer to dry my herbs on the stem and then crumble off the leaves after they are dried. After crumbing to the size I like, I put the herbs into jars and label. Easy. I know some prefer to pick or cut the leaves off the stem first. Another simple idea is to freeze herbs in small portions for later use. For freezing, my preferred method is to cut off the leafy parts, chop into small pieces, mix with a little water, and then freeze in ice cube trays. (I have trays designated for freezing herbs only, because this can stain or "flavor" the trays which may not be desirable for making ice cubes.) This process can be sped up even more quickly with the use of a food processor or blender. Cut off the herbs, add enough water to make the chopper go 'round. Chop. Freeze. Easy. One last idea from our Workshares is preserving the herbs in oils (usually olive oil). They use the chop and freeze method, but mixing with oil instead of water. Some ladies have even kept chopped herbs covered in oil in the fridge for a few weeks. Each time they want to sautee a little zucchini or other fresh veggies, they just scoop out a spoon full of herbs + oil and add it to the heated pan for cooking. Simple, easy, and yummy! With all of these methods, nothing is going to waste. Just takes a little time, but well worth the effort. From Farmer Shain: You can expect beets soon, and Dino kale. He's going to get in another planting of salad in soon. A micro burst came through our little farm on Sunday, breaking more greenhouse ropes and literally pulling some metal posts out of the ground. He's spent several hours repairing greenhouses and replacing row covers around the farm. First picking of snap peas! We went away for a few days (our annual trip to Island Park, ID, to see our son's music camp performances) and came back to a bounty of food everywhere we looked. All ready at once - snap peas, chard, parsley, salad mix, zucchini, and more. Things are kicking up a notch and we are busy! This heat is bringing on the earwigs. Yuck! So keep your eyes open, especially in this week's share of Chinese cabbage and head lettuce. Earwigs love summer greens, but we are very careful so hopefully you won't see much of them. We have pretty high standards; however, the reality of being "organic" means there will be some small holes in larger leafy greens like the chard. Pac choi is a cool weather crop, so it's no wonder that in the heat of July our last row is flowering. When it bolts like this, we harvest everything, keeping the best for our CSA shares and tossing the worst to the chickens. This is our last pac choi harvest for the season. May I recommend using your bunch of Cilantro to make Shain's recipe of Holy, Hand-Mashed Guacamole. Or, Carol's quick and easy recipe for Creamy Cilantro Dressing. Or Shain's Plant=based Cilantro Cream Sauce which we recently enjoyed over bean and veggie soft tacos. We are approaching a significant transition point in the season, this week and next will be the end of eating from our first spring plantings. Soon we'll be harvesting new crops like zucchini, squash, carrots, beets, Swiss chard, kale and Snap peas. These foods and more are SO CLOSE to being ready, Shain says some will be harvested next week, others in 2 weeks or soon after. Row of baby carrots getting some much needed weeding attention. Meanwhile, we continue to plant (more head cabbage, more salad greens, more basil, etc.) and then, you guessed it, lots of weeding! We'd love some help on these kind of projects, just a few hours can make a significant dent in our chore list. And the more projects we complete, or the more rows we weed - all leads to a greater harvest of yummy foods for yourself, your family, and your committee. I LOVE knowing that EverGreen Farm CSA members have been receiving food for a month while some CSAs and farmers markets are just starting for the season. Just as I predicted, our shares may start out a little small but soon it's to the point of being hard to fit everything into a bag. Shain and I take great pride in knowing we are helping people eat well. It was a big disappointment to see that our newest row of salad greens were so badly damaged from the hail and rain storm that pelted our farm last week. (On Wednesday, delivery day, in fact. I remember it well.) But we have more planted so in a week or two our famous salad mix will be back in the shares again. 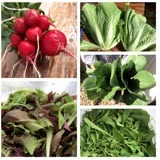 Recently planted: more salad greens, more butter bib head lettuce, dill, basil, and more red table beets. Several rows have been cleared out this week and we are knocking projects out one at a time. Lots of great work happening here. Thanks to our FABulous Workshares! We are now starting at 7 am each morning to beat the heat, but even then, we are working in some serious hot weather. Every week I think back and I'm amazed at what we accomplish! Carol sent me a recipe for Mashed Turnips. The photo of her dish was so tempting I even tried making the recipe myself, but without the bacon. I'll be honest, adapting my cooking to be entirely plant-based vegan doesn't always work out as I envision it. But I keep trying, or I let Shain cook. Yeah, I let Shain cook. See what I mean. Much better. Shain's "Blackened Pac Choi" dish (recipe from The PlantPower Way). 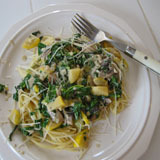 Sauteed mushrooms over mid to baby sized pac choi drizzled with lemon juice, and tamari and a sprinkle of pickled capers. I ended up chopping it all up into a salad and ate it right out of the dish because I didn't want any of the juices to go to waste. This was today's lunch: coconut red curried veggies over rice. Featuring our farm turnips, greens and Chinese cabbage. Plus a yam and black beans. This kind of meal is a staple at our house. The "I have to make room in the fridge for this week's CSA share" scenario is very real for us too. I am happy to report that we are no longer pumping any water. Our 2017 flooding is over! Our home is slowly getting back to normal. Toilets are so very nice and convenient. :) Now to clean and put our basement back to something that resembles normal.